Neurotar® is a niche preclinical Contract Research Organization (pCRO) offering in vivo two-photon animal imaging services to pharmaceutical and biotechnology industries. Conventional in vitro microscopy offers excellent resolution (tens to hundreds of nanometers), but the relevance of results obtained on dissociated cells or fixed tissue sections is limited. Conventional in vivo imaging, conversely, offers maximal relevance of repeated analysis of the same animal’s brain over time (milliseconds to weeks or months), but its spatial resolution is severely limited. 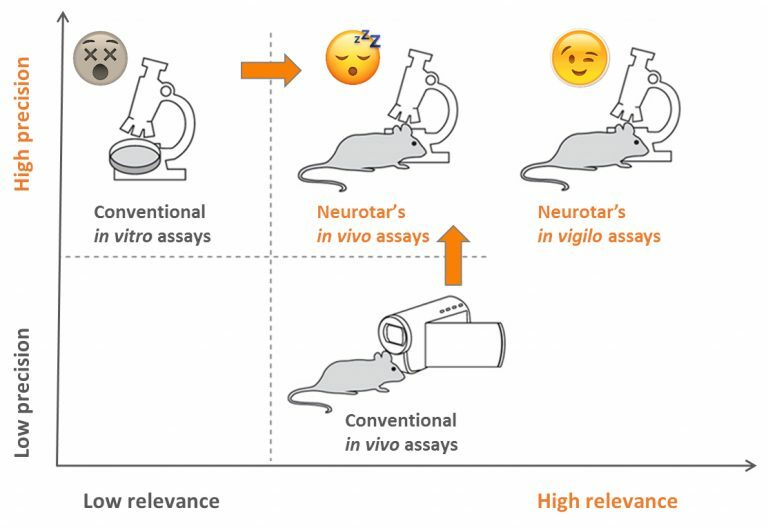 Neurotar’s in vivo microscopy combines the benefits of both techniques and avoids their shortcomings. It enables high relevance images (within a live animal) with high resolution (nanometer scale). We perform microscopic imaging in the brain of live (anesthetized or awake) and follow longitudinally the disease progression and effects of treatments with sub-cellular resolution. Savings on capital investment into two-photon equipment and top-notch imaging expertise. Sub-micrometer (lateral) or micrometer (vertical) spatial resolution due to intrinsic optical sectioning of two-photon microscopy. Multicolor, multiparametric 3D image stacks are acquired every 10-30 minutes in multiple imaging sessions (over days to months). We can simultaneously monitor e.g. integrity of BBB, kinetics of biomolecule’s permeation into brain tissue, its binding to cellular and sub-cellular targets, and its effects on brain cell morphology and function. Fine details of disease-related or treatment-induced changes in cellular structure and sub-cellular drug distribution may often be perceived immediately by simply viewing our 3D movies. Our brains are “wired” to interpret images much more efficiently than words or numbers. In vivo microscopy is non-invasive and can be performed longitudinally, i.e. the same subject (and even the same cell or organelle within the animal’s brain) can be used as its own control in repeated measurements. There is no need to compensate for data scatter by increasing the subject number. We use less than 8 animals per group for most of our studies. Using the subject as its own control enables paired t-test analysis, and makes it possible to normalize the data to pre-treatment baseline thus providing ratiometric measurements that are quantitatively comparable between study subjects. As a result, data variability is dramatically reduced and statistical significance of results is enhanced. A carefully designed two-month-long in vivo two-photon microscopy study requires only a small cohort of animals (5-6 per group) and provides a large number of correlated space- and time-resolved parameters (related to biodistribution, morphology, function, safety). This allows earlier and better-informed preclinical decisions, avoiding costly clinical failures and shortening time to market. Neurotar has a number of validated assays designed in the Client-driven process of combining various readouts in one experiment. We will work closely with your scientists to further customize our study outline to get the information you need in a well-controlled and optimized manner. Designing and running an in vivo two-photon imaging experiment requires years of first-hand experience. But this is not all: meaningful data analysis can be extremely challenging and time-consuming. You benefit from our expertise, proprietary algorithms of image analysis automation and experience obtained both from internal R&D and from service to other customers.